Switzerland’s monetary gold reserves are held by the Swiss National Bank (SNB) and valued on the SNB balance sheet at market prices. Although substantial in size, gold accounts for only 6% of the SNB’s total foreign reserves due to the SNB having expanded its foreign currency reserves over 2011-2015 in an attempt to weaken the Swiss Franc vis-a-vis the Euro. The SNB sold 1300 tonnes of gold over the 2000 to 2008 period in one of the central bank world’s biggest ever series of gold sales. The SNB’s gold stored in New York was used for much of these sales via location swaps with gold held at the Bank of England in London. An initiative to force the Swiss National Bank to repatriate its foreign held gold to Switzerland was launched in 2011 by Swiss political party SVF culminating in a country-wide referendum in November 2014. This referendum failed to pass its proposals but did force the SNB to reluctantly divulge some information on its gold storage arrangements. As well as storing its own gold bars in its headquarters building in Berne, the SNB provides a gold custody service for other central banks. Gold storage customers of the SNB include the Bank of Italy, the Swedish Riksbank, the Bank of Finland, and the Bank for International Settlements. Switzerland maintains the world’s 8th largest official gold reserves, with holdings of 1040 tonnes of gold. These gold reserves are owned by the State but held by the Swiss National Bank (SNB). The SNB sold off 1550 tonnes of Switzerland’s gold between 2000 and 2008, at a time when the gold price was rising sharply. Without these gold sales, Switzerland would be the world’s 4th largest official sector gold holder. The SNB is demonstrably secretive about its gold activities and operations, and reveals minimum information to the public. Under Switzerland’s national gold reserve policy, the Swiss National Bank (SNB) holds and manages Switzerland’s gold reserves. This policy is derived from the Swiss Federal Constitution which grants the SNB its independence and mandate. Article 99 of the Constitution requires that the SNB hold sufficient currency reserves / foreign exchange reserves, part of which must be in the form of gold. In April 2013, the SNB for the first time clarified the storage locations and locational distribution of Switzerland’s gold reserves, revealing that approximately 70% of Swiss gold reserves are stored in Switzerland, 20% at the Bank of England in London, and 10% with the Bank of Canada in Ottawa. 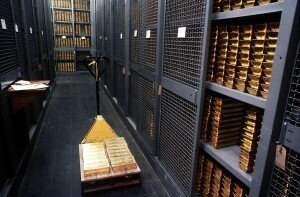 Until that time, the SNB had never revealed the storage locations of the country’s gold, citing security reasons. The SNB’s 2013 gold storage policy announcement was strategic in nature that it was primarily an attempt to deflect criticism levelled by the promoters of the Swiss Gold Initiative (see below) about the SNB’s lack of transparency on its gold activities. The SNB also claimed in its April 2013 announcement that it had been exclusively storing its gold in Switzerland, the UK and Canada “for over 10 years”. The Swiss Gold Initiative or ‘Save our Swiss Gold’ campaign was a Federal popular initiative launched by members of the Swiss People’s Party (SVP) in 2011 with the intention of altering the Swiss Federal Constitution. The Swiss National Bank must hold at least twenty percent (20%) of its total assets in gold. Although the referendum was not successful and did not get the required majority of votes on the day, it did force the Swiss National Bank to divulge a lot more information about the Swiss gold reserves than it ever otherwise would have revealed, and also showed up the SNB to be inconsistent in its continual excuses for opposing the referendum motions. Prior to 2000, Switzerland held 2,590 tonnes of gold, making the country the world’s 4th largest official gold holders. However, between 2000 and 2005, and again between 2007 and 2008, the SNB sold off a combined 1,550 tonnes of its gold reserves. These gold sales programs were pre-planned in the 1990s by the SNB and elements within the Swiss Government even though the central bank at that time did not have authorisation to sell any gold. However, through a series of manoeuvres, this ‘sell gold’ contingent within the Swiss central bank and finance ministry axis succeeded in convincing the Swiss government and people to self-detonate their nation’s store of wealth. Firstly in 1997, the Constitutional requirement for the Swiss Franc to be 40% backed by gold was lowered to a 25% backing. Subsequently in 1997, an ‘Expert Group’ made up of the SNB and staff from the Swiss Federal Administration recommended that Switzerland should sell 1,300 tonnes of gold, arguing that with a reduced 25% gold backing requirement, Switzerland would otherwise end up holding surplus gold. In April 2000, further constitutional amendments were put to the Swiss electorate which proposed dropping the 25% gold backing for the currency and severing the link between the Swiss Franc and gold. These amendments passed after which the Swiss National Bank proceeded to sell 1300 tonnes of gold between 2000 and 2005, all sales of which fell under the first and second Central Bank Gold Agreements which coordinated gold sales among European central banks. Between May and September 2000 the SNB sold 120 tonnes of gold. Over the subsequent 12 months from October 2000 to September 2001, the SNB sold another 200 tonnes. The first 220 tonnes of these sales were executed by the Bank for International Settlements on behalf of the SNB. The SNB then directly executed gold sales itself from October 2001, selling 980 tonnes over four years until September 2005. Of the 1300 tonne total sold between 2000 and 2005, 730 tonnes settled using gold at the Bank of England. Between 2007 and 2008, the SNB sold an additional 250 tonnes of its remaining gold, claiming that it needed to rebalance its reserves between foreign currencies and gold. The combined gold sales from 2000 to 2008 totalled 1550 tonnes, and reduced Switzerland’s gold holdings from 2590 tonnes to 1300 tonnes. 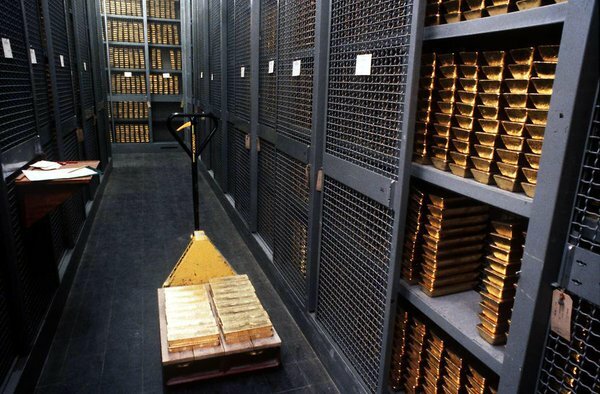 A number of other central banks and official monetary institutions, such as the Bank for International Settlements (BIS), are on record as storing some of their gold reserves with the SNB in Berne. This also confirms the existence and location of the SNB’s gold vaults. 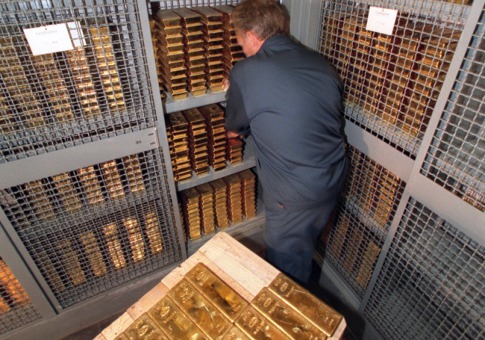 Therefore, the SNB does not just store its own gold, it stores gold on behalf of fellow central banks. The BIS does not have its own gold vaults in Switzerland or anywhere else. However the BIS offers gold custody facilities, term gold deposit facilities and spot and forward purchase and sale gold transactions with settlement ‘loco London’, loco New York, and ‘loco Berne’. For ‘loco Berne’ the BIS uses the SNB’s gold vaults. The Banca d’Italia revealed in 2014 that it holds a small percentage of its gold with the Swiss National Bank through a BIS account arrangement. The Swedish Riksbank announced in October 2013 that it holds 2.8 tonnes of gold (or 2.2% of its overall gold reserves) with the Swiss National Bank. The Bank of Finland also announced in October 2013 that it holds 3.43 tonnes (7%) of its gold reserves in the custody of the SNB. The Swiss National Bank (SNB) also facilitates gold lending operations for its central bank customers and therefore indirectly it provides gold custody services to commercial banks in the context of gold lending operations. However, the SNB does not offer commercial banks gold storage services beyond transactions linked to gold lending. The SNB’s 2011 balance sheet shows an amount of 14.9 tonnes under line item ‘Claims from gold transactions’, and nil under the same line item for year-end 2012. When the SNB did engage in gold lending in the 2000s, its gold lending program was manged by then SNB senior manager Michael . Paprotta was also responsible for the SNB’s gold sales program. Like its major neighbour central banks in France, Germany and Italy, the Switzerland central bank holds substantial gold reserves, however, unlike the French, German and Italian central banks, the SNB’s gold reserves make up a very small percentage of its total foreign reserve assets. This is because the SNB rapidly expanded its balance sheet between 2011 and 2015 due to pursuing a monetary policy goal of maintaining a target exchange rate between the Swiss Franc and the Euro of 1.20, which necessitated the purchase of huge amounts of foreign currency (which produced the bloated balance sheet). The SNB holds its gold reserves as an asset on its balance sheet in the form of monetary gold, which is classified as line item “Gold Holdings” and is valued at financial year-end at a market price in CHF (Swiss Francs) per kilogram. The SNB states in its annual reports that its “gold holdings consist of gold ingots and gold coins”. In another SNB publications titled ‘The Swiss National Bank in Brief’, the SNB states that its “gold holdings are mainly in the form of gold bars, with the remainder in gold coins”. However, in response to a BullionStar question about the types of gold coins held by the SNB, the Swiss central bank responded that it “does not publish details regarding gold bars and gold coins.” This again shows the secrecy and lack of transparency with which the SNB actually acts in matters related to its gold holdings and gold activities.